German composer, born at Eutin, near Lübeck, on the 18th of December 1786, of a family that had long been devoted to art. His father, Baron Franz Anton von Weber, a military officer in the service of the palgrave Karl Theodor, was an excellent violinist, and his mother once sang on the stage. His cousins, Josepha, Aloysia, Constanze and Sophie, daughters of Franz Anton's brother Fridolin, attained a high reputation as vocalists. The great composer, Mozart, after having been rejected by Aloysia, married Constanze, and thus became Franz Anton's nephew by marriage. Fridolin played the violin nearly as well as his brother; and the whole family displayed exceptional talent for music. Franz Anton von Weber was a man of thriftless habits and culpable eccentricity. Having been wounded at Rosbach, he left the army, and in 1758 he was appointed financial councillor to Clement August, elector of Cologne, who for nine years overlooked his incorrigible neglect of duty. But the elector's successor dismissed him in 1768; and for many years after this he lived in idleness at Hildesheim, squandering the property of his wife, Anna de' Fumetti, and doing nothing for the support of his children until 1778, when he was appointed director of the opera at Lübeck. In 1779 the prince bishop of Eutin made him his kapellmeister, and not long afterwards his wife died of a broken heart. Five years later he went to Vienna, placed two of his sons under Michael Haydn, and in 1785 married the young Viennese singer Genovefa von Brenner. 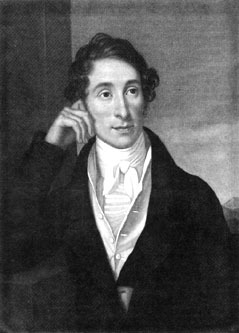 In the following year Carl Maria von Weber was born -- a delicate child, afflicted with congenital disease of the hip-joint. On his return from Vienna, Franz Anton, finding that a new kapellmeister had been chosen in his place, accepted the humbler position of "Stadt Musikant." This, however, he soon relinquished; and for some years he wandered from town to town, giving dramatic performances, in conjunction with the children of his first wife, wherever he could collect an audience. The effect of this restless life upon the little Carl Maria's health and education was deplorable; but, as he accompanied his father everywhere, he became familiarized with the stage from his earliest infancy, and thus gained an amount of dramatic experience that laid the foundation of his future greatness. Franz Anton hoped to see him develop into an infant prodigy, like his cousin Mozart, whose marvelous career was then rapidly approaching its close. In furtherance of this scheme, the child was taught to sing and place his fingers upon the pianoforte almost as soon as he could speak, though he was unable to walk until he was four years old. Happily his power of observation and aptitude for general learning were so precocious that he seems, in spite of all these disadvantages, to have instinctively educated himself as became a gentleman. In 1798 Michael Haydn taught him gratuitously at Salzburg. In the March of that year his mother died. In April the family visited Vienna, removing in the autumn to Munich. Here the child's first composition -- a set of "Six Fughettas" -- was published, with a pompous dedication to his half-brother Edmund; and here also he took lessons in singing and in composition. Soon afterwards he began to play successfully in public, and his father compelled him to write incessantly. Among the compositions of this period were a mass and an opera -- Die Macht der Liebe und des Weins -- now destroyed. A set of "Variations for the Pianoforte", composed a little later, was lithographed by Carl Maria himself, under the guidance of Alois Senefelder, the inventor of the process, in which both the father and the child took great interest. In 1800 the family removed to Freiberg, where the Ritter von Steinsberg gave Carl Maria the libretto of an opera called Das Waldmädchen, which the boy, though not yet fourteen years old, at once set to music, and produced in November at the Freiburg theater. The performance was by no means successful, and the composer himself was accustomed to speak of the work as "a very immature production"; yet it was afterwards reproduced at Chemnitz, and even at Vienna. Carl Maria returned with his father to Salzburg in 1801, resuming his studies under Michael Haydn. Here he composed his second opera, Peter Schmott und seine Nachbarn, which was unsuccessfully produced at Nuremberg in 1803. In that year he again visited Vienna, where, though Joseph Haydn and Albrechtsberger were both receiving pupils, his father preferred placing him under Abt Vogler. Through Vogler's instrumentality Carl Maria was appointed conductor of the opera at Breslau, before he had completed his eighteenth year. In this capacity he greatly enlarged his experience of the stage, so that he ranks among the greatest masters of stagecraft in musical history; but he lived a sadly irregular life, contracted debts, and lost his beautiful voice through accidentally drinking an acid used in lithography -- a mishap which nearly cost him his life. These hindrances, however, did not prevent him from beginning a new opera called Rübezahl, the libretto of which was "romantic" to the last degree, and Weber worked at it enthusiastically, but it was never completed, and little of it has been preserved beyond a quintet and the masterly overture, which, rewritten in 1811 under the title of Der Beherrscher der Geister, now ranks among its author's finest instrumental compositions. Quitting Breslau in 1806, Weber removed in the following year to Stuttgart, where he had been offered the post of private secretary to Duke Ludwig, brother of Frederick, king of Würtemberg. The appointment was a disastrous one. The stipend attached to it was insufficient to meet the twofold demands of the young man's new social position and the thriftlessness of his father, who was entirely dependent upon him for support. Court life at Stuttgart was uncongenial to him, though he yielded to its temptations. The king hated him and his practical jokes. He fell hopelessly into debt, and, worse than all, became involved in a fatal intimacy with Margarethe Lang, a singer at the opera. Notwithstanding these distractions he worked hard, and in 1809 re-modelled Das Waldmädchen, under the title of Sylvana, and prepared to produce it at the court theater. But a dreadful calamity prevented its performance. Franz Anton had misappropriated a large sum of money placed in the young secretary's hands for the purpose of clearing a mortgage upon one of the duke's estates. Both father and son were charged with embezzlement, and, on the 9th of February 1810, they were arrested at the theater, during a rehearsal of Sylvana, and thrown by the king's order into prison. No one doubted Weber's innocence, but after a summary trial he and his father were ordered to quit the country, and on the 27th of February they began a new life at Mannheim. Having provided a comfortable home for his father, and begun a new comic opera, in one act, called Abu Hassan, Weber removed to Darmstadt in order to be near his old master Abt Vogler, and his fellow-pupils Meyerbeer and Gänsbacher. On the 16th of September 1810, he reproduced Sylvana at Frankfurt, but with very doubtful success. Abu Hassan was completed at Darmstadt in January 1811, after many interruptions, one of which (his attraction to the story of Der Freischütz) exercised a memorable influence upon his later career. Weber started in February 1811 on an extended artistic tour, during which he made many influential friends, and on the 4th of June brought out Abu Hassan with marked success at Munich. His father died at Mannheim in 1812, and after this he had no settled home, until in 1813 his wanderings were brought to an end by the unexpected offer of an appointment as kapellmeister at Prague, coupled with the duty of entirely remodelling the performances at the opera house. The terms were so liberal that he accepted at once, engaged a new company of performers, and directed them with uninterrupted success until the autumn of 1816. During this period he composed no new operas, but he had already written much of his best pianoforte music, and played it with never-failing success, while the disturbed state of Europe inspired him with some of the finest patriotic melodies in existence. First among these stand ten songs from Körner's Leyer und Schwerdt, including "Vater, ich rufe dich", and "Lützow's wilde Jagd"; and in no respect inferior to these are the splendid choruses in his cantata Kampf und Sieg, which was first performed at Prague, on the 22nd of December 1815. Weber resigned his office at Prague on the 30th of September 1816, and on the 21st of December, Frederick Augustus, king of Saxony, appointed him kapellmeister at the German opera at Dresden. The Italian operas performed at the court theater were superintended by Morlacchi, whose jealous and intriguing disposition gave endless trouble. The king, however, placed the two kapellmeisters on an exact equality both of title and salary, and Weber found ample opportunity for the exercise of his remarkable power of organization and control. He now gave his close attention to the story of Der Freischütz, which he had previously meditated turning into an opera, and, with the assistance of Friedrich Kind, he produced an admirable libretto, under the title of Des Jägers Braut. No subject could have been better fitted than this to serve as a vehicle for the new art form which, under Weber's skilful management, developed into the type of "romantic opera." He had dealt with the supernatural in Rübezahl, and in Sylvana with the pomp and circumstance of chivalry; but the shadowy impersonations in Rübezahl are scarcely less human than the heroine who invokes them; and the music of Sylvana might easily have been adapted to a story of the 19th century. But Weber now knew better than to let the fiend in Der Freischütz sing; with three soft strokes of a drum below an unchanging dismal chord he brings him straight to us from the nether world. Every note in Euryanthe breathes the spirit of medieval romance; and the fairies in Oberon have an actuality quite distinct from the tinsel of the stage. This uncompromising reality, even in face of the unreal, forms the strongest characteristic of the pure "romantic school" as Weber understood and created it. It treats its wildest subjects in earnest, and without a doubt as to the reality of the scenes it ventures to depict, or the truthfulness of their dramatic interpretation. Weber wrote the first note of the music of Der Freischütz on the 2nd of July -- beginning with the duet which opens the second act. But so numerous were the interruptions caused by Morlacchi's intrigues, the insolence of unfriendly courtiers, and the attacks of jealous critics that nearly three years elapsed before the piece was completed. In the meantime the performances at the opera house were no less successfully remodelled at Dresden than they had already been at Prague, though the work of reformation was far more difficult; for the new kapellmeister was surrounded by enemies who openly subjected him to every possible annoyance, and even the king himself was at one time strongly prejudiced against him. Happily, he no longer stood alone in the world. Having, after much difficulty, broken off his liaison with Margarethe Land, he married the singer Carolina Brandt, a noble-minded woman and consummate artist, who was well able to repay him for the part he had long played in her mental development. The new opera was completed on the 13th of May 1820, on which day Weber wrote the last note of the overture -- which it was his custom to postpone until the rest of the music was finished. There is abundant evidence to prove that he was well satisfied with the result of his labors; but he gave himself no rest. He had engaged to compose the music to Wolff's Gipsy drama, Preciosa. Two months later this also was finished, and both pieces ready for the stage. In consequence of the unsatisfactory state of affairs at Dresden, it had been arranged that both Preciosa and Der Freischütz -- no longer known by its original title, Des Jägers Braut -- should be produced at Berlin. In February 1821 Sir Julius Benedict was accepted by Weber as a pupil; and to his pen we owe a delightful account of the rehearsals and first performance of his master's chef-d'oeuvre. Preciosa was produced with great success at the old Berlin opera house on the 14th of June 1821. On the 18th of June, the anniversary of the battle of Waterloo, the opening of the new "Schauspielhaus" was celebrated by the production of Der Freischütz. Much anxiety was caused by unforeseen difficulties at the rehearsals; yet, so calm was Weber's mind that he devoted his leisure time to the composition of his Concertstück in F minor -- one of his finest pianoforte pieces. Until the last moment his friends were anxious; the author was not; and the result justified his confidence in his own powers. The success of the piece was triumphant. The work was received with equal enthusiasm at Vienna on the 3rd of October, and at Dresden on the 26th of January 1822. Yet Weber's position as kapellmeister was not much improved by his success, though, in order to remain faithful to his engagements, he had refused tempting offers at Berlin and Cassel, and, at the last-named place, had installed Ludwig Spohr in a position much more advantageous than his own. For his next opera Weber accepted a libretto based, by Frau Wilhelmine von Chezy, on the story of Euryanthe, as originally told in the 13th century, in Gilbert de Montreuil's Roman de la Violette, and repeated with alterations in the Decamerone, in Shakespeare's Cymbeline, and in several later forms. In place of the ghostly horrors of Der Freischütz, the romantic element was here supplied by the chivalric pomp of the middle ages. The libretto is in one respect superior to that of Der Freischütz, inasmuch as it substitutes elaborate recitative for the spoken dialogue peculiar to the German "Schauspiel" and French "opéra comique." It is, in fact, a "grand opera" in every sense of the words -- the prototype of the "music drama" perfected fifty years later by Richard Wagner. The overture -- as usual, written last -- presents a feature that has never been imitated. During its performance the curtain temporarily rises, to exhibit, in a tableau vivant, the scene in the sepulchral vault upon which the whole story turns. This direction is now rarely carried out; but Weber himself well knew how much the interest of the piece depended on it. The work was produced at the Kärntnerthor theater in Vienna, on the 25th of October 1823, and received with enthusiasm. Weber's third and last dramatic masterpiece was an English opera, written for Covent Garden theater, upon a libretto adapted by Blanché from Wieland's Oberon. It was disfigured by the spoken dialogue abandoned in Euryanthe; but in musical beauty it is quite equal to it, while its fairies and mermaids are as vividly real as the spectres in Der Freischütz. Though already far gone in consumption, Weber began to compose the music on the 23rd of January 1825. Charles Kemble had offered him £1000 for the work, and he could not afford to rest. He finished the overture in London, at the house of Sir George Smart, soon after his arrival, in March 1826; and on the 12th of April the work was produced with triumphant success. But it cost the composer his life. Wearied out with rehearsals and performances of the opera, and concerts at which he was received with rapturous applause, he grew daily perceptibly weaker; and, notwithstanding the care of his kind host, Sir George Smart, and his family, he was found dead in his bed on the morning of the 5th of June 1826. For eighteen years his remains rested in a temporary grave in Moorfields chapel; but in 1844 they were removed and placed in the family vault at Dresden, Wagner making an eloquent speech. Besides his three great dramatic masterpieces and the other works already mentioned, Weber wrote two masses, two symphonies, eight cantatas, and a large number of songs, orchestral and pianoforte pieces, and music of other kinds, amounting altogether to more than 250 compositions. Weber's style rises, in his three greatest works, to heights which show his kinship with the great classics and the great moderns. His intellect was quick and clear; but yet finer was the force of character with which he overcame the disadvantages of his feeble health, desultory education and the mistakes of his youth. With such gifts of intellect and character, every moment of his short life was precious to the world; and it is impossible not to regret the placing of his training in the hands of Abt Vogler. Weber's master was an amiable charlatan, whose weakness as a teacher was thoroughly exposed, in perfect innocence, by his two illustrious pupils. Meyerbeer wished to be famous as the maker of a new epoch in opera. Weber could not help being so in reality. But he was sadly hampered by his master's inability to teach realities instead of appearances; and to this impediment alone must we assign the fact that his masterpieces do not begin earlier in his career. With extraordinary rapidity and thoroughness he learned English a year before his death in order to compose Oberon, with the result that there is only one obvious mistake in the whole work, and the general correctness of declamation is higher than in most of his German works. This is typical of Weber's general culture, mental energy and determination; points in which, as in many traits in his music, he strikingly resembles Wagner. But all his determination could not quite repair the defects of his purely musical training, and though his weaknesses are not of glaring effect in opera, still there are moments when even the stage cannot explain them away. Thus the finale of Der Freischütz breaks down so obviously that no one thinks of it as anything but a perfunctory winding-up of the story, though it really might have made quite a fine subject for musical treatment. In Euryanthe Weber attained his full power, and his inspiration did not leave him in the lurch where this work needed large musical designs. But the libretto was full of absurdities; especially in the last act, which not even nine remodellings under Weber's direction could redeem. Yet it is easy to see why it fascinated him, for, whatever may be said against it from the standpoints of probability and literary merit, its emotional contrasts are highly musical. Indeed it is through them that the defects invite criticism. Oberon is spoiled by the old local tradition of English opera according to which its libretto admitted of no music during the action of the drama. Thus Weber had in it no opportunity for his musical stagecraft; apart from the fact that the action itself is entirely without dramatic motive and passion, since the characters are simply shifted from Bordeaux to Bagdad whenever Oberon waves his wand. Many attempts have been made to improve the libretti of Euryanthe and Oberon, but none are quite successful, for Weber has taken a great artist's pains in making the best of bad material. All that can be said against Weber's achievements only reveals the more emphatically how noble and how complete in essentials was his success and his claim to immortality. His pianoforte works, while showing his helplessness in purely musical form, more than bear out his contemporary reputation as a very great pianoforte player. They have a pronounced theatrical tendency which, in the case of such pieces of gay romanticism as the Invitation à la danse and the Concertstück, is amusing and by no means inartistic. In orchestration Weber is one of the greatest masters. His treatment of the voice is bold and interesting, but very rash; and his declamation of words is often incorrect. His influence on the music of his own day is comparable to his influence on posterity; for he was not only a most efficient director but a very persuasive journalist; and (in spite of the inexperience that made him disapprove of Beethoven) for all good music other than his own he showed a growing enthusiasm that was infectious.